She wore the finish line flag. Seriously. Kitty wore the finish line flag to graduation in the form of a cute dress I got for her via a new online favorite: edropoff (http://www.ebay.com/usr/edropoff?_trksid=p2047675.l2559) on ebay. EDropoff is a consignment, used couture site that has some very elegant things (ie Chanel) down to things more perceivable. 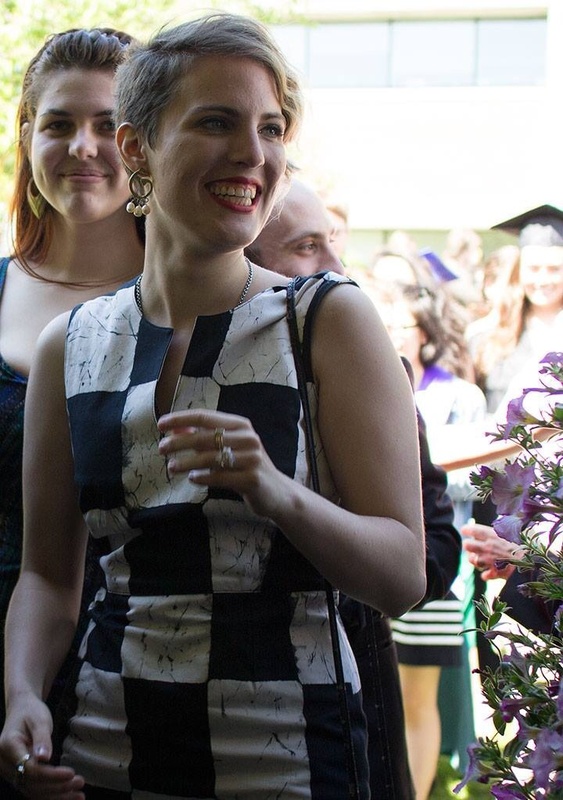 I bought her a few things for her birthday (a vintage, silk Diane Von Furstenburg for one), and was taken by this crazy checked dress which I thought might be fun to pursue a job or just to sport as Kitty is a dress person too. I thought she would like the dress, turns out...big hit. And, as we were summing up how excited we were with the graduation et al, I said to her that it just seemed so right that she wore a finish line flag to commencement. She hadn't thought of it that way...but somehow knew, albeit unconsciously, that it was the way it needed to be. So graduation was a perfect day. HIgh skies, low humidity, high excitement, high ideals, high thinking. Kitty had moved from the blues of the night before to "on"--in presentation mode for the show. She sparkled and glowed with Hannah LIbby on one side, and Susie S. to the other--two glorious companions to progress from being students to being alumni in the world. We had lots of great speeches focused on being yourself, carrying the Hampshire ideals and tenets into the world--fighting for what is right for yourself, your people, your world. It was a singular moment to be greeted by this larger than life person, the baby you nursed, the child you shared the emergency room with, the sketch partner, co-conspiritor and friend--with her arms out, her eyes glittering, and her being...so so there. I was incredibly moved in that moment---one of those times that the background freezes and goes still...and through that focus, that tunnel of cognition, that this dear person was one with the now, the then and the future. It was a moment of recognition of all the blessings I have been handed--and most particularly, the gift of family and my dear ones. I am grateful to be handed this moment of passage, of change and of growth. I wouldn't want to be anywhere else though I have to admit, it is a bit itchy. Kitty and her finish line flag dress with Hannah Libby (left). Hampshire College Graduation: Class of 2014, Amherst MA.